Approximately 536 B.C. recording events that occurred from about 605-536 B.C. Daniel had been taken captive and deported to Babylon by Nebuchadnezzar in 605 B.C. There he served in the government for about 70 years during the reigns of Nebuchadnezzar, Belshazzar, Darius, and Cyrus. Daniel, Nebuchadnezzar, Shadrach, Meshach, Abednego, Belshazzar, Darius. 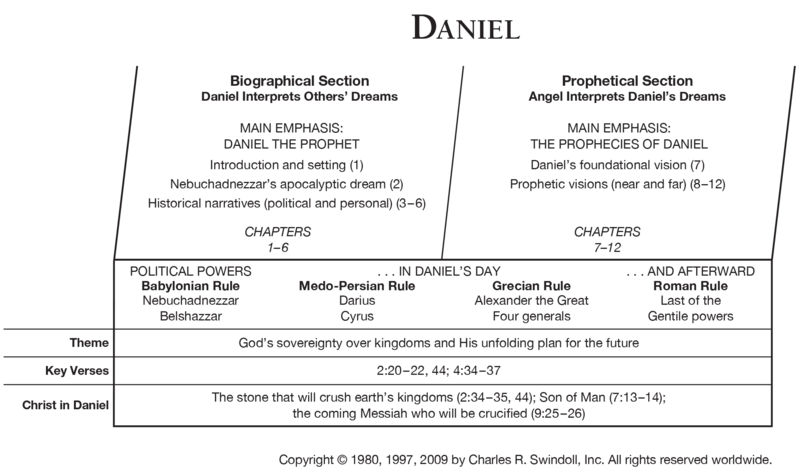 Daniel's apocalyptic visions (chapters 7-12) give a glimpse of God's plan for the ages, including a direct prediction of the Messiah. Sold as a slave and taken to Egypt, but maintained godly character despite numerous setbacks. A model of integrity both in adversity and prosperity. Taken to Babylon as captives of war and trained for service in a pagan government. Models of integrity and commitment to the Lord while carrying out duties for unbelievers. A strategically placed official in the Persian court who was allowed to return to Jerusalem and rebuild the wall. A model of leveraging one’s position to accomplish God’s purposes while overcoming hostile opposition. Two members of an ethnic minority who found themselves in a position to influence a godless king. Models of taking courage and acting wisely in order to withstand evil. Word in life study Bible . 1997, c1996 (electronic ed.) (Dn 2.48). Nashville: Thomas Nelson. Richards, L., & Richards, L. O. (1987). The teacher's commentary. Includes index. (445). Wheaton, Ill.: Victor Books. Would come from Rome (fourth kingdom). Would come from Greece (third kingdom). Would be an eleventh horn, rooting up three of ten horns. Would be a fifth horn, coming our of one of four horns. Would prsecute God’s people for 42 months or 3 1/2 years. Wouls persecute God’s people for 2,300 days or over 6 years. New Geneva study Bible. 1997, c1995 (electronic ed.) (Dn 6.22). Nashville: Thomas Nelson. Dextee of Artaxerxes to Nehemiah—March 14, 445 B.C. New Geneva study Bible. 1997, c1995 (electronic ed.) (Dn 9.4). Nashville: Thomas Nelson. New Geneva study Bible. 1997, c1995 (electronic ed.) (Dn 12.8). Nashville: Thomas Nelson. Served as a prophets to the exiles in Babylon from 605-56 B.C. The people of Judah were captives in a strange land, feeling hopeless. God is sovereign over all human history, past, present, and future. We should spend less time wondering when future events will happen and more time learning how we should live now. Daniel and his three friends chose not to eat the king's food. They did not bow down to the king's image, even under penalty of death. Daniel continued to pray even though he knew he might be noticed and sentenced to death. These men are inspiring examples for us of how to live godly lives in a sinful world. When er face trials, we can expect God also be with us through them. May God grant us similar courage to remain faithful under pressure. These visions gave the captives added confidence that God is in control of history. They were to wait patiently in faith and not worship the gods of Babylon or accept that society's way of life. God still rules over human activities. Evil will be overcome, so we should wait patiently and not give in to the temptations and pressures of the sinful way of life around us.